In my last post about Distance Traveled by NBA Teams during a Season I offered an innocent curiosity… but quite typically for me it lead to more questions plus more serious questions… and man, I went big this time. Instinctively I wrote about Portland’s loneliness on the US map with recent team’s relocations from Seattle and Vancouver and then I hit me… wait a second, I can check the influence of those changes! 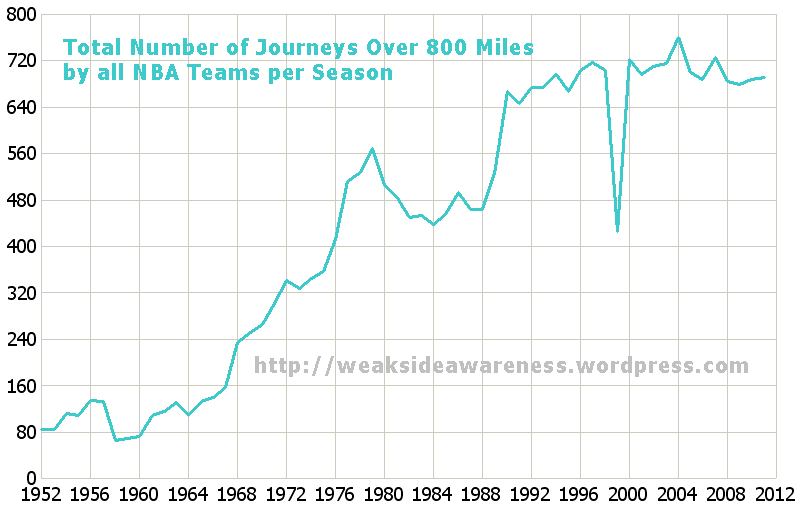 Average journey for each NBA team in a single season? That’s nice… but how about the whole history? I could finally settle the issue how amount of travel actually has changed through league’s history! – I totally ignored random games in temporary locations but I included changes which lasted at least a season. So for example, Nets spent one year in New York so I accounted for that in calculations but if the same Nets played a game in Kansas due to some difficulties I assumed they played at home. In recent decades this point probably doesn’t matter but in early days of the NBA it could have some impact. – I totally ignored exhibition games like those in London or Tokyo and I assumed they were played in team’s arena. There were few of them and I prefered to save some time than play with such details. – This batch of numbers in some cases is slightly different than in my previous post because there I used scheduled games and here I used games when they actually happened [so any postponed games made a tiny difference here]. 1)Shockingly in the 60s players traveled more per game than in the 90s! 4) In the last 20 years NBA either used similar schedule or they figured out the most optimal version of it. Also, have I found a reason why relocation to San Francisco might not be a good idea? P.S. If you want to know something specific from this dataset, let me know in the comments. Also so much data led to another post about Patterns in All-Time NBA Schedule. Hey – I’m doing a class project on the decline in home court advantage in the NBA. One of my theories is regarding changes in travel. 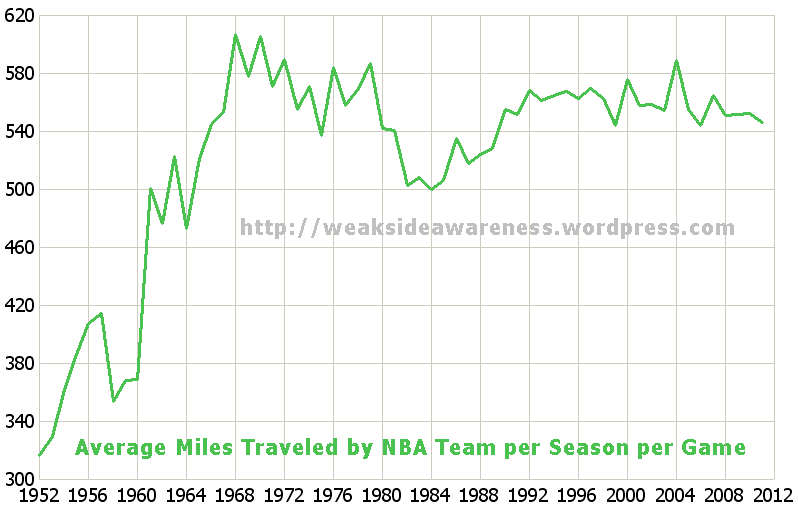 I’m wondering if I can see the ‘Average Miles Traveled by NBA Team per Season per Game Since 1952’. I will credit you in my paper of course. Also, I was wondering if you have or know where I can acquire data about the ease of travel for NBA players today compared to the 60s, 70s and 80s.